Integrated with the function of iPhone ringtone converter, iPhone ringtone creator and iPhone ringtone uploader, Tipard iPhone Ringtone Maker for Mac is a powerful and easy-to-use Mac iPhone Ringtone Maker for iPhone user. This Mac iPhone Ringtone Maker can convert almost all mainstream video / audio including MPEG, WMV, MP4, MPEG, XviD, MOV, RM,AAC, WMA, MP3 to M4R iPhone ringtone on Mac.Then upload converted ringtone to iPhone directly. 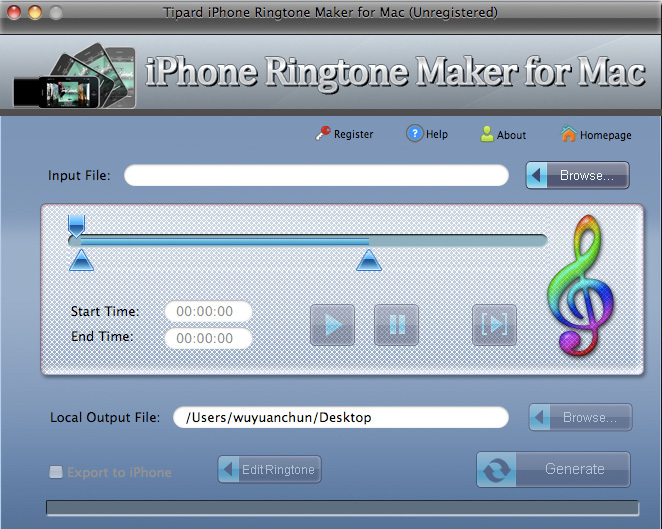 a powerful and easy-to-use Mac iPhone Ringtone Maker for iPhone user. ...... any video/audio and convert it into iPhone ringtone.Just upload files then converting, you will be the master of iPhone ringtone. Free download this iPhone Ringtone Maker for Mac to create unique ringtone now and show the newest iPhone ringtone to your friends. 1. Convert music file like MP3 to M4R iPhone ringtone on Mac OS X. With this best iPhone Ringtone Maker for Mac, you can convert any loved music to iPhone ringtone such as convert WMA, AAC, WAV, OGG, M4A, RA, RAM, AC3, MP2, MP3 to M4R iPhone Ringtone on Mac. 2. Rip audio from video to create ringtone for iPhone. Tipard iPhone Ringtone Maker for Mac can extract audio from any video formats AVI, MPEG, WMV, MP4, FLV, MKV, H.264/MPEG-4, DivX, XviD, MOV, RM, RMVB, M4V, VOB, ASF, 3GP, 3G2, H.264, QT, MPV, etc and convert them to M4R as the ringtone for iPhone on Mac. 3. Convert music segment to ringtone. Qweas is providing links to Tipard iPhone Ringtone Maker for Mac 3.2.28 as a courtesy, and makes no representations regarding Tipard iPhone Ringtone Maker for Mac or any other applications or any information related thereto. Any questions, complaints or claims regarding this application Tipard iPhone Ringtone Maker for Mac 3.2.28 must be directed to the appropriate software vendor. You may click the publisher link of Tipard iPhone Ringtone Maker for Mac on the top of this page to get more details about the vendor.